Built with 20th-century technology, Mechagodzilla is the ultimate in Godzilla-busting weaponry. It’s fueled by a nuclear reactor and sheathed in a synthetic diamond shield. The Japanese government hopes that the mammoth metal robot is Godzilla’s equal. Meanwhile, on a remote island polluted by nuclear waste, a team of scientists discover a giant egg in a Pteranodon nest. They bring the egg home to study. When BabyGodzilla hatches, both Rodan and Godzilla return to claim the cuddly infant as their own. Will their monstrous maternal instincts cause a custody battle capable of destroying Mother Earth? Or will Mechagodzilla destroy them both, leaving BabyGodzilla an orphan for life? First off, it should be mentioned that Godzilla vs. Mechagodzilla II is not a sequel to Godzilla vs. Mechagodzilla, despite the title. On one hand, it’s a three-way monster mashup with Godzilla vs. Rodan vs. Mechagodzilla. They’re fighting over Baby Godzilla. 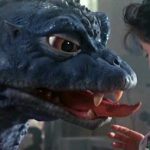 Who, thankfully, isn’t the cutesy Godzilla Jr. from the dream movie All Monsters Attack. But on the other hand, it’s more than that. Kazuma Aoki (Masahiro Takashima, Godzilla vs. Destoroyah). The “dinosaur nerd” who is an expert on the Garuda (flying anti-Godzilla craft). He’s added to the “G-Force” anti-Godzilla team. A square peg who doesn’t fit into a round hole. But he has good insights, and thinks of combining Garuda with Mechagodzilla to make – SuperMechaGodzilla! Miki Saegusa (Megumi Odaka, Godzilla vs. Space Godzilla). Miki is an interesting character – a telepath, with a link to Godzilla. Despite her misgivings, she uses her telepathic link with Godzilla as part of the military attack against him. The character is actually a link in the various Hensei Godzilla movies, appearing here, with Space Godzilla, and Destoroyah as well. And she becomes philosophical about the future return of the dinosaurs as well. Rodan looks after his “baby brother”. They’re both from the same nest, similar to Midwich Cuckoos. And fights with Godzilla over “custody”. And rescues Godzilla towards the end of the movie, so that he, in turn, can rescue Baby Godzilla. Later in the film, he mutates further into Fire Rodan. Godzilla comes in search for his “son”, Baby Godzilla – who calls for him. He’s a very protective father. And I love the ending of the movie, where they walk off into the ocean together. It’s very sweet. 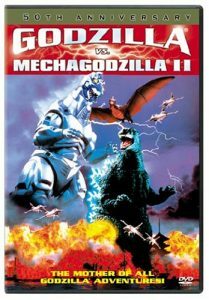 Godzilla vs. Mechagodzilla II, (released in Japan as Godzilla VS Mechagodzilla (ゴジラVSメカゴジラ Gojira tai Mekagojira? ), is a 1993 Japanese science fiction kaiju film produced by Toho. Directed by Takao Okawara and featuring special effects by Koichi Kawakita, the film starred Masahiro Takashima, Ryoko Sano, and Megumi Odaka. Despite being produced and released in 1993, this twentieth film in the Godzilla series was marketed as the 40th anniversary Godzilla movie. The film featured the return of classic characters from the original series such as Rodan and Mechagodzilla, as well as introducing an infant Godzilla named Baby Godzilla. Although it shares a title with Godzilla vs. Mechagodzilla, this film is neither a remake or re-imagining of the earlier film.